"We wanted to control the numbers of flies in the cow barn for less cost and without spray. But instead we eliminated almost all the flies in the barn and also reduced the flies outdoors. 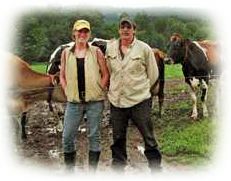 We started because I read one of the testimonials printed from Wisconsin in Hoard's Dairyman and then picked up the phone. I was sure out there they would not just say that if it wasn't true. Out in Central Wisconsin, they stick to the facts." Call to discuss starting a biological fly management plan optimized for your operation. We have one of the most experienced team of advisors, with decades of experience with small and large animal facilities nationwide, to help you plan and manage a fly control programoptimized for your operation. Don’t delay as the best time to start is before pest fly populations have reached the serious problem level.